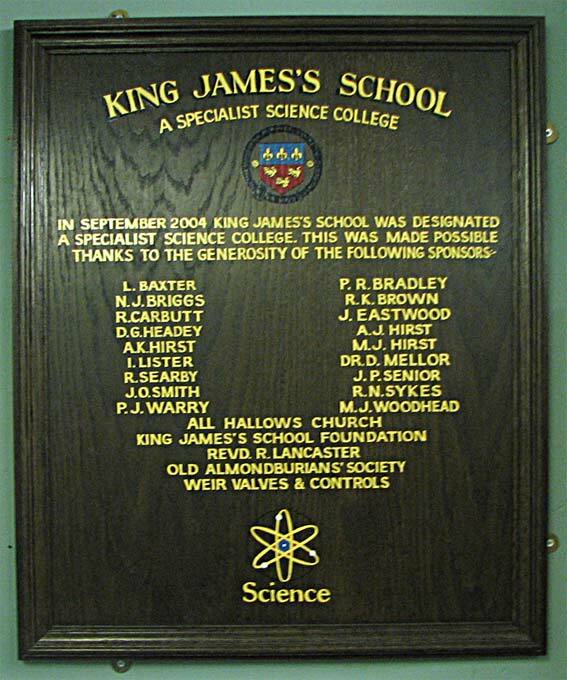 King James's School was designed a Specialist Science College in 2004 thanks to generous sponsorship support from The Old Almondburians' Society, the King James's School Foundation, and those organisations and individuals listed on this board on display at the School. Specialist schools are an important part of the Government's plans to raise standards in secondary education. As a Specialist Science College, King James's School is using its specialist status to create a challenging environment, to raise standards of achievement and to enhance the quality of teaching and learning in science and mathematics for all students. The School's objective is to become a centre of excellence in scientific, technological, enterprising and vocational education.